Before making pootarekulu watch another movie of mine on Pootarekulu-Technicalities. Read the text given below where all minute details of making fine pootarekulu are discussed. Take rice into a bowl and add water. Wash the rice well to clear off dust and dirt by rubbing between fingers. If required change water and wash two to three times. Then add fresh water to the washed rice and soak it for two hours. Usually in villages they wash rice and grind it in wet grinder for one hour after adding water. But to avoid pressure on my wet grinder and to minimize the grinding time I am soaking the rice for two hours. I have used a table top model wet grinder to grind the rice. Fix stones in the grinder bowl and add soaked rice. Add some water and start grinding. In my case it required 300ml water to grind the rice---but do not add all the water at once. While grinding, observe that the rice grains sticks to the sides of the bowl. Take a flat spatula and push the grains sticking to the sides of the bowl. Cover the grinder bowl as the batter splashes and makes the place around messy. Grind till the batter is soft to touch without any grains. It took 30 minutes to grind the rice in my case. Transfer the batter into a bowl and divide it into two portions. While making pootarekulu we are going to add more water to this batter. in case the batter becomes thin while adding water (as we are still learning and are not experts) we can add some thick batter from the other portion to maintain consistency. Take a single burner stove (with big burner). Place the seasoned pootarekula kunda (as discussed in my other movie clip) on the gas stove in inverted position and fix it with wires. Switch on the flame and heat the pot till the temperature on the pot is between 110oC and 120oC. Take 50ml oil. Dip the cloth in oil and smear the pot with the oiled cloth. Into a wide mouthed deep plate (See the Movie) add one portion of the batter. To this batter add 125ml water and mix well. To get the right consistency, for 300gms of the prepared batter I have added 125ml of water. Observe this consistency and remember it mentally. While making pootarekulu the batter thickens — then through adding water in between, maintain the consistency level at which you started. Check the consistency of the batter. if the batter is thin we do not get pootarekulu. If the batter is thick we get pootarekulu but they would be difficult to make folds (Chuttalu). Coat batter on the cloth by dipping it in batter in the manner shown. Holding with both hands lift the cloth and drain off excess batter dripping from the cloth. Take the cloth to the back of the pot and start applying coat on the pot. In one stretch pull the cloth fast on the pot and observe a thin layer of batter is coated on the hot pot. Now increase the flame and allow the batter to form a sheet on the pot. When the sheet is formed, with dry fingers gently shake in the centre and carefully slide the sheet to one side and remove it from the pot. Place this sheet in a plate or in my case I have used a winnowing basket. Now make another pootareku. First lower the flame, sprinkle oil and smear oil on the pot with oiled cloth. Dip and coat batter on the cloth. Form a thin coat on the hot pot with the batter coated cloth. Increase the flame and wait for the sheet to form on the pot. Carefully slide the sheet to one side and place it on the first sheet as shown. Repeat this process and make pootarekulu. After some time observe that the batter sticking on the sides of the plate gets dried up. With wet fingers clean the sides of the plate. Add the dried batter into the plate and mix well. When using small quantity of batter (Batter made with 250gms of rice) batter thickens fast. Hence add water to the batter and maintain consistency as mentioned above. Like this make pootarekulu till all the batter is used up. Make a pile of sheets in the winnowing basket. Once mastered the art of making pootarekulu it is wise to make batter with 1/2Kg to one Kg rice and make sheets. Pootarekulu would remain fresh for long period when stored in cardboard boxes away from moisture. However they start smelling oily after 15 to 20 days. Having mastered the art of making pootarekulu, make in reasonable batches and consume within one month. Store the pootarekulu in cardboard boxes to retain the crispness. Cover the box and store in a dry place. Never try to make chuttalu as soon as you make pootarekulu as they will crumble into pieces. If you make pootarekulu today then make pootarekula chuttalu tomorrow. Then only one can easily make chuttalu with the pootarekulu. Melt ghee in a microwave oven or on gas stove. Take sugar into a dry mixie jar and grind to a fine powder. Place a small holed sieve into a bowl and add the powdered sugar. Sift the powdered sugar to get fine powder without any grains. The powdered sugar should melt in your mouth so it is necessary to sift the ground sugar to obtain fine powdered sugar. Dip a soft cloth in water and squeeze out all the water. To make one chutta we need to take two pootarekulu. Take one pootareku and wet it with the wet cloth to soften it. Wherever we find the pootareku crisp there press with wet cloth so that it softens and will be easy to fold. Do not wet the pootareku for long as it will break easily. Similarly slightly soften the other pootareku also. Place the two softened sheets one above the other. Sprinkle and spread sufficient ghee to coat the surface of the pootareku. Take some powdered sugar into a tea strainer. Sprinkle powdered suagr with tea strainer on the ghee spread pootareku. Sprinkling with tea strainer ensures that the entire sheet is evenly coated with powdered sugar. It also requires less powdered sugar when sprinkled with tea strainer rather than sprinkling with fingers or using a spoon. Now fold the pootareku as shown and spread ghee on the folded portion. Now sprinkle powdered sugar evenly on the fold with tea strainer. Powdered sugar sticks to the ghee and firmly stays in place. Now start folding from one side---as the sheet is softened it will fold without breaking or crumbling into pieces. Fold it half way through and stop. Now start folding from the other side. Place the first fold above the second fold and make the chutta. 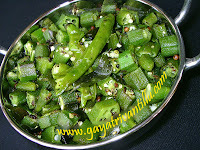 This crispy and tasty pootarekula chutta is ready to eat now. Place any vessel, plate or a glass (for pressure) above this chutta to flatten it. Pootarekulu would stay crisp for long period without getting spoiled when stored away from moisture in cardboard boxes whereas pootarekula chuttalu would not stay for more than 6 days. Make chuttalu as per requirement as and when desired. Season the pot before making pootarekulu. Use only unpolished rice or parboiled rice to make pootarekulu. 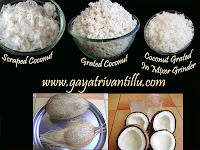 Grind the rice to a fine texture to get good pootarekulu. If using parboiled rice it requires more water. It also requires more water while making pootarekulu unlike the unpolished rice batter. The pootarekulu made with parboiled rice batter would be thinner than the pootarekulu made with unpolished rice. It is advisable to have some thick batter while making pootarekulu. After adding water to the batter it if becomes thin then we need some thick batter to maintain the consistency. So till one gets practice in making pootarekulu it is better to divide the batter into two portions and start making pootarekulu. Batter kept aside for long time gets fermented. We do not get pootarekulu when made with fermented batter. So start making pootarekulu as soon as batter is prepared. So while learning to make pootarekulu it is advisable to use small quantity of batter say batter made with 250gms of rice. Once practiced making pootarekulu then it is advisable to make pootarekulu with batter made with 500gms to 1 Kg of rice. We start making pootarekulu when the pots temperature is around 120oC. As we progress the temperature rises to 140oC to 160oC. Beyond 160oC the rekulu would get burnt and we need to give a small pause for 5 minutes for the pot to cool down. In traditional method of heating it is relatively easy to stop the overheating of the pot. As we are working on a gas stove we need to allow the pot to cool in-between. Remember to lower the flame of the gas stove before applying layer of batter on the pot and to increase the flame once applied. Batter forms lumpy when applied on high flame. Similarly we would not get crisp pootareku if the flame is too low. So increase the flame as soon as batter is applied on the pot to make it crisp. The ideal temperatures are between 140 to 160 where you get the best lot. Remember to choose a place where there would not be breeze while making pootarekulu. Even light breeze shifts the flame on the gas stove to one side and pot gets unevenly heated. While coating batter on the pot pull the cloth at one stretch to form an even layer. Batter coated slowly forms lumps on the layer. Its preferable to use heavy oil like groundnut oil to coat the pot instead of light oils like sunflower or saffola etc. You may choose to apply ghee (clarified butter) too after gaining expertise. Store the pootarekulu away from moisture in cardboard boxes and they will stay crisp for a long period. But chuttalu will not stay for more than six days. As we add powdered sugar they will not be crisp for long and hence gets spoiled. So make 25 to 30 pootarekulu and consume within a month by making chuttalu as and when required. This sweet is high on calories and while making you are in the proximity of heat surfaces for long time. mee website choosanu ,chala santosham andi. mee pootarekulu recipe ,oka adbhutam andi. memu intlo chesukolemo kani,ela cheyyavachu annadi telusukunnam. I saw your putharekulu recipe. It is really awesome. How much clearly u explained that recipe is can't say in words. Ofcourse u explained every recipe in the same way. Iam a big fan of you.